Celebrating one art through another is a rarity but cinema is an excellent medium where you can celebrate an unforgotten art , provided if you got some great actors , excellent technical team and of course a passionate producer to convert your dream into reality. Well, Vasantabalan is lucky enough to get all the above said things in his period-drama Kaaviya Thalaivaan and to be honest, he nailed it! Kaaviya Thalaivan , as the name suggest it is about an epic leader Kaliappa Baghavathar( Siddharth) who ruled the 1940s drama and his brother like Gomathi Nayagam Pillai (Prithviraj) who is also a great drama artist of that time. When two people are great in a field, it’s obvious that there will be a competition, there will be a rivalry and it happens here as well. We have seen similar rivalry and friendship bond in Mani Ratnam’s political drama Iruvar where nature separates the duo but here Vasantabalan’s backdrop is completely different and the director has sketched Prithviraj’s character with a grey shade which appears to be odd. Of course for Mani Ratnam there was a reference in the real life of two leaders but Vasantabalan got an opportunity to incorporate some imagination in ending the film and it is quite convincible. The Kalippa Baghavathar role is a dream character for any actor and Siddharth portrayed with great elan. The scene where Siddharth enacting ‘Sooran’ character is splendid, also his effort in pronouncing the ancient Tamil is commendable. The sequence where Siddharth turns drunkard and explode at his guru is brilliant, must say the actor deserves an award for his stellar performance. Though Prithviraj has played the dark –shaded Gomathi Nayagam Pillai with great effort, his Malayalish- Tamil is a drawback. As the film is about Tamil actors, an artist like Pasupathi would have been a better choice and ironically he is Vasantabalan’s favorite actor too. Wonder what made Vasantabalan to forget Pasupathi? It is so good to see an actress performing in a film and Vedhika has given a beautiful performance as Vadivambal . The actress looked perfect as a drama artist and her majestic screen presence along with glowing expression is really adorable. Last but not least, Nassar as Sivadas Swamigal is extra-ordinary and the actor has used all his expertise for his role. The scene where Nassar gets angry on Siddharth and kick him out of the drama troupe is analogous to Siva’s Rudhrathaandavam(Guess a perfect metaphor for that terrific acting). What I really liked about Vasantabalan’s Kaaviya Thalaivan is that he didn’t compromise his characters for the sake of happy ending. I find the climax to be convincing, as there is a rivalry exist between the two lead characters, it has to be end in a way that should do justice to both their roles and Vasantabalan has exactly did the same but as said earlier if ‘time’ destroyed one of the two characters it would have been better, nevertheless Vasantabalan deserves a big applause for his effort in registering an art which is almost forgotten by us. Technically, Kaaviya Thalaivan is flawless especially AR Rahman’s composition is out of the world, be it the songs and background score the composer has shown his class in the film. Nirav Shah’s cinematography beautifully picturized the 1940’s period aesthetically and Praveen KL’s editing make sure that the film flows smooth and coherent. 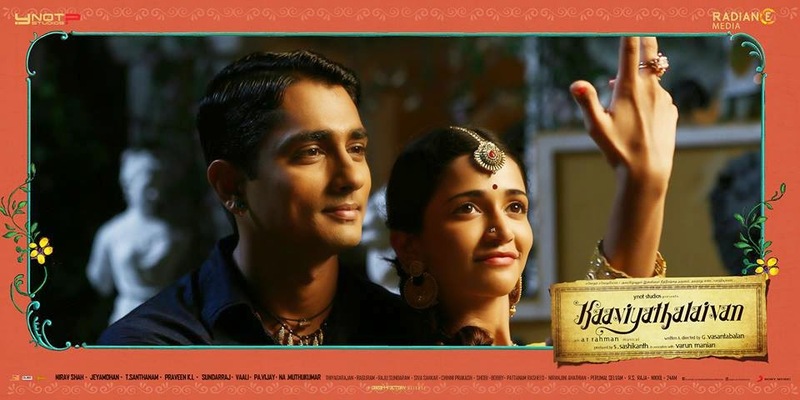 Art direction by Santhanam is highly authentic that it set a perfect ambience for the period drama. Overall, Kaaviya Thalaivan is an artistic gem that shouldn’t be missed.